The draw of Copenhagen is evident 30 seconds after you step (or glide, depending on your mode of transport) into its city limits. People walk around cheerfully, the air is clear, the streets and canals clean, and the sights are beautiful and modern. Considering Copenhagen is one of Europe’s oldest cities, you may be amazed by its efficiency and modernity, but you shouldn’t be surprised. Denmark has proudly sought to maintain a clean, efficient and friendly atmosphere in its capital city (and throughout the country), and because of continued efforts, it continuously receives top marks on lists of happy and most livable cities in the world. According to the World Happiness Report 2013, a measure of happiness published by the UN’s Sustainable Development Solutions Network, Copenhagen ranked as the happiest city in the world in 2013; this year it is a very close third, just behind Switzerland (which took the top slot) and Iceland. Copenhagen has also enjoyed the number-one spot in Monocle’s Quality of Life Survey in both 2013 and 2014, with Tokyo and Melbourne in second and third place in 2014. Copenhagen’s host country is situated in Northern Europe and almost completely surrounded by water. Denmark consists of the peninsula of Jutland (touching northern Germany), 406 islands (80 of which are inhabited) and 7,314 kilometers of coastline. Ranking 133rd on the list of world countries in terms of size, Denmark has a population of fewer than 6 million, about a quarter of which live in Copenhagen, located on the eastern shore of the island of Zealand, facing the Øresund strait that separates Denmark and Sweden. Aside from its happiness ratings, Denmark is known around the world for its Viking history, famous authors and novelists, fresh seafood and sleek modern design, visible in every corner of the country. Being a tourist in a foreign city can feel a bit daunting at times, but have no fear. Copenhagen’s many harbor tour companies make excellent use of the city’s pristine canals and provide wonderful sights, witty stories and general overviews of the area. Sign up for a ride and get your bearings without having to move an inch. What you’ll see is well worth the money and the time, and while you float from one spot to the next, use your map to plan out where you want to revisit in more detail. Get to know Denmark’s history at this fabulous museum, located in the Prince’s Palace. Free to the public, the National Museum is actual a collection of museums all over the country, each featuring slightly different exhibits. This particular museum location has permanent collections featuring classical antiquities, Viking age treasures and other Danish prehistoric artifacts, Egyptian mummies, a royal collection of coins and medals, and even a children’s museum, where kids can play dress up and recreate history. If you haven’t visited Denmark before, you may not realize that the country still has a sitting royal family, and they live (at least for part of the year) in the Amalienborg Palace, one of several around the country. If you don’t have time to visit the inside of this castle – made up of a series of buildings that include a museum of royal life past and present – then at least come for the changing of the Royal Guard, which takes place daily at noon. To enjoy the experience of the World’s Best Restaurant 2014 (and the third best of 2015) is not so easy, but if you make a reservation several months ahead of time (yes, the waiting list is that long), you’ll have the ability to taste founder René Redzepi’s innovative masterpieces and New Nordic Cuisine. NOMA, housed in an unassuming 18th century warehouse facing Nyhavn, boasts two Michelin stars, the highest of any restaurant in the country. Located just a few minutes walk from City Hall, Tivoli Gardens is the perfect place for magic and amusement. Loved by Hans Christian Andersen, Walt Disney and many others, Tivoli boasts lovely gardens and lively thrill rides. Among Tivoli’s attractions are the Minen (a diamond mine where dragons come to life), the Golden Tower (that lifts you 63 meters over the city) and one of the oldest wooden roller coasters in the world, built in 1914. Tivoli also hosts concerts and open-air music events for the public throughout the year. One of Copenhagen’s most iconic symbols is the Little Mermaid statue (Den Lille Havfrue), sculpted by Edvard Eriksen and given as a gift to the city from Danish brewer Carl Jacobsen in 1913. Based on the Hans Christian Andersen fairytale, the sculpture is made of bronze and granite, and has had her fair share of vandalism over the years. She has lost her arm once, her head has been cut off twice, and she has fallen prey to numerous paint attacks. Receiving more than a million visitors a year, this beautiful symbol of Copenhagen is worth the visit. With an outer structure made almost entirely of glass, the Royal Danish Playhouse shows off Danish ingenuity and design in a stunning way, and stands as a modern masterpiece among Copenhagen’s beautiful old style. On the edge of the Nyhavn district, the Playhouse is host to an opera, a ballet and an orchestra. The building also houses a delightful café and restaurant in which you can enjoy Nordic flavors and sip a Carlsberg beer (Copenhagen’s local beer) with a great view of the harbor and passerby. Step into the past at the Open Air Museum in Lyngby, located about 16 kilometers north of Copenhagen’s center. A must-see for every explorer, you’ll enjoy learning about Danish, Swedish and Norwegian history by walking around the extensive grounds, covering over 86 acres and home to more than 100 farmhouses, mills, rural buildings and workmans’ shops. The museum is easy to get to by public transportation, and is free for all entrants. Built in the Dutch Renaissance style by King Christian IV in the 17th century, Frederiksborg Castle (or “slot” in Danish) is the largest Renaissance Castle in Scandinavia. Situated to the north of Copenhagen in the town of Hillerød, the Castle houses elaborately decorated rooms with famous artwork, baroque style gardens, and – since 1878 – the Museum of National History. Visitors have the opportunity to see 500 years of Danish history through portraits, woodcuts, furniture and other decorative art. 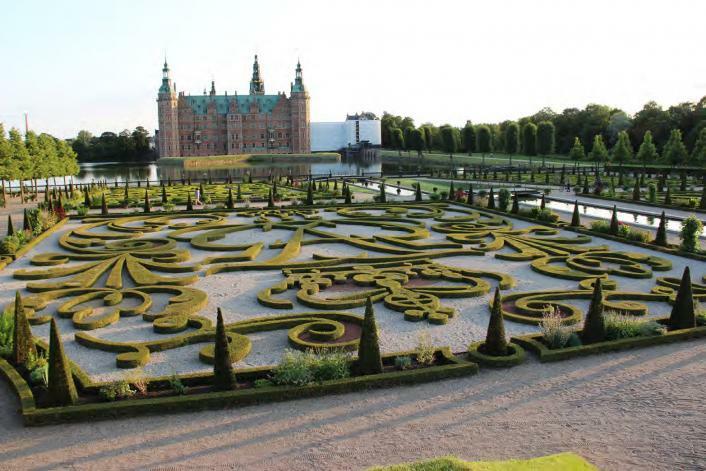 Frederiksborg sits on a castle lake, and is surrounded by glamorous Renaissance style gardens, which are open to the public free of charge and on their own are well worth the trip up here from the city. A native New Yorker and globe trekker, Danica works as a graphic designer at Miles. Outside of designing destination magazines and websites, she loves traveling and she has visited and lived in more than 20 countries around the world. Some of her favorite destinations are France, Italy and Denmark. A foodie at heart, Danica loves trying new foods, speaking foreign languages and soaking up the culture and history of any place she visits.